Skull symbolism is the attachment of symbolic meaning to the human skull. The most common symbolic use of the skull is as representation of death and mortality. Our present society predominantly associates skull with death and evil. A skull is considered the most effective and earliest symbols proven to mankind therefore, it is not surprising that skull jewellery has altered in to a popular fashion trend. Among these types of jewellery are skull engagement rings, skull bell button rings, as well as other skull wedding rings. 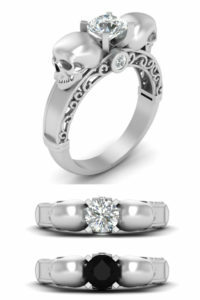 We have put together a list of skull wedding rings with our top picks, Check out them below. Note 1 : If you want more details of the product click on the image. 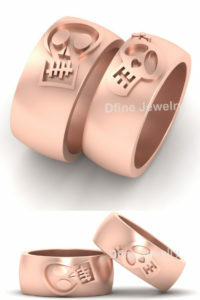 Presenting you Super cool matching skull wedding rings. Rose gold colour on this band makes it more beautiful and attractive. This band is also available in metal like 925 solid sterling silver, 10kt gold, 14kt gold, 18kt gold. Just like rose gold rhodium it is also available in black, yellow and white rhodium. Approx weight of the band is 30 gm (Actual weight of the band set may vary with size). 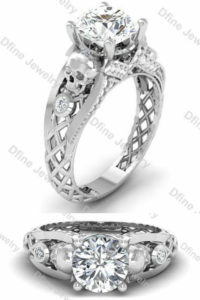 And the price range of this Matching skull wedding ring is from 299.99$ to 2199.99$. What to say about this diamond skull wedding ring, It has almost everything skulls, diamonds and design. On this beautiful piece you can replace solitaire white diamond with black diamond, pink diamond or any other colour which is available. Like diamond you can choose metal too. The approx carat weight of the diamond is 0.70ct. To make the ring affordable you can replace the real diamonds with lab created one. The price range of the ring is from 119.99$ to 549.99$. To describe this unique piece one can say, two geeky skull with diamonds in the eyes ring. The main feature of this ring is size adjustable, you can adjust the size of the ring as per your finger size. For this ring you can choose the diamonds from lab created to real as per your budget. This ring price is ranges from 99.99$ to 599.99$. Two face skull with September birth stone blue sapphire. One can relate this by September birth as sapphire stones are fitted in it. 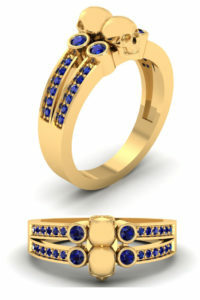 This combination of blue sapphire stone with yellow gold is really eye catching. If you believe in some astrology then you can fit any of the stone that astrologically help you. The ring is available from 129.99$ to 599.99$. 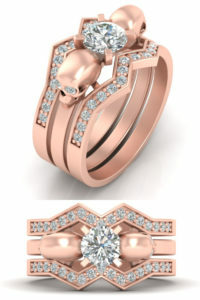 Rose gold with pink diamond OH MY GODDD girls are crazy about this beautiful combination. This one is special, unique, beautiful and trust me this flower and skull engagement ring will look more awesome in real than this picture. By giving choice to this you can have variation in metal as well as in diamonds. 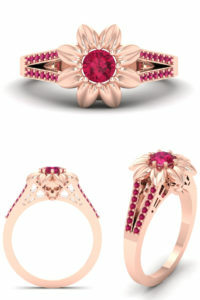 To make it more affordable you can go with pink lab created pink ruby as real pink diamonds are very much expensive. This ranges from 124.99 to 599.99. Now now now something for men too. This solo skull on the band surrounded by the diamonds look so fashionable. In this wedding ring giving shape to the size of the skull is needed some serious art work, And believe me we are giving it with full satisfaction. Black rhodium is currently the most trending color and finish on the jewelry. And why not, black is always in fashion from years and it will be in future. 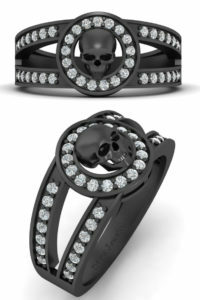 This deadly skull ring ranges from 149.99$ to 649.99$. This is the most popular and most selling ring from the website. And i can proudly say that this ring’s design is made by the owner of the dfine jewelry store. 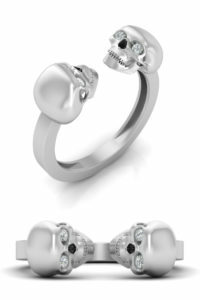 Now come to the ring this gorgeous ring has everything one can ask for skull wedding rings. It has two skulls, solitaire, accents and band design. The net type design on band of the ring makes it unique and beautiful. You can go with any metal color for this ring like white, yellow, rose, black. And to make affordable you can go solid 925 sterling silver with lab created diamonds or gemstones. This gorgeous ring ranges from 89.99 to 499.99. This biker skull wings ring design is specially designed for bikers. One can have this band in any metal like solid 925 sterling silver, 10kt gold, 14kt, 18kt gold. There are some variation in color too like silver, rose gold, gold, black. the approx weight of the band is 8 gm (Actual Weight of The Ring May Vary With Size). This band is ranges from 149.99$ to 1,099.99$. Now we have no. 1 skull ring in the list. Beautiful….. isn’t it??? So if i start to explain from skulls two skulls on middle band with diamond in the eyes. The middle band has solitaire too of approx 0.65ct carat weight. Two bands with diamonds makes it look so gorgeous. You can wear it with supportive bands or without it. 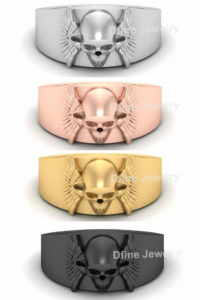 So thats the top 10 list of skull wedding rings by Dfine Jewelry Store. Skull is symbolise for impermanence, skulls were used in many different kinds of ancient rituals and religious art as a reminder of your own death. 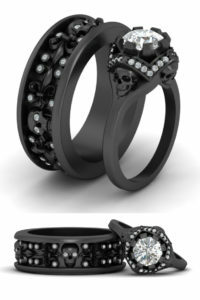 It may also function as your support when confronting and dispelling your fears, like the fear of death and the irrational fear of creepy things like skulls, corpses and ghosts….So…don’t be afraid…get some skulls and skull wedding rings.